It’s remarkably hard to find pictures of just the PEB (the inverter and DC/DC converter) of the Q210 as a single unit. I came across this single one though. I am the first to admit it is not a very interesting picture, but it’s all we have at the moment. Note that the box is upside down in this picture. 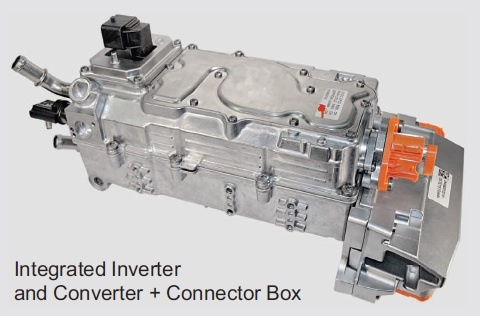 Imagine the orange connectors on the left side when facing the car, and the entire module upside down, so the square black block, which I suspect is the 12 volt connector from the DC/DC converter being on the right bottom side. The visible orange connector feeds the rotor coil for excitation. Tucked away under that metal ridge at the far right side (so in reality, on the top left side) are the 3 connectors to the stator coils.